Manila, Philippines - San Mig Coffee Mixers managed to tie series versus Rain or Shine, 80-70 in Game 2 of the PLDT Home DSL Philippine Cup finals on Sunday, February 16, 2014 at the SMART-Araneta Coliseum in Cubao, Quezon City. Jeff Chan makes a buzzer-beating three to end the game but San Mig Coffee took 10-point advantage to claim victory. Peter June Simon started the fire for the Mixers, scoring seven points to spark San Mig Coffee’s 14-4 start. Chan was the lone Rain or Shine player in double-figures with 18 points. 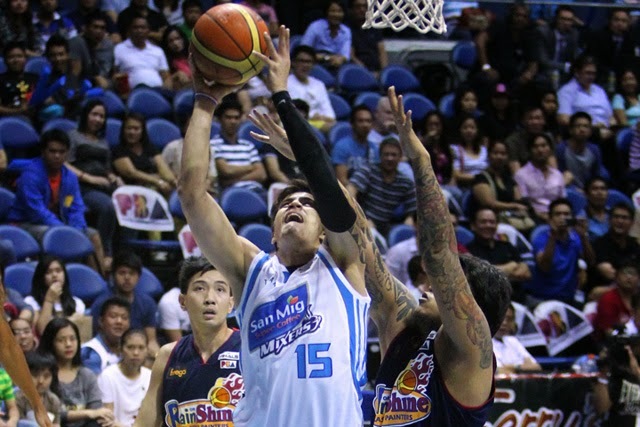 Mark Pingris scores 11 points, 12 rebounds, 4 assists and two blocks to lead San Mig Coffee. Marc was named Idol Player of the Game. Game Three of the PBA Finals is scheduled on Wednesday at 8 p.m. also at the Big Dome. SAN MIG SUPER COFFEE 80 – Simon 15, Devance 13, Yap 13, Pingris 11, Sangalang 10, Mallari 8, Barroca 4, Reavis 4, Melton 2, Gaco 0. RAIN OR SHINE 70 – Chan 18, Cruz 8, Norwood 8, Belga 7, Lee 7, Almazan 5, Teng 5, Quinahan 3, Nuyles 3, Tang 2, Ibanes 2, Rodriguez 2, Arana 0, Tiu 0.